Book Condition: This item shows wear including some highlighting or writing and moderate wear to edges and cover. Comment: This item shows wear including some highlighting or writing and moderate wear to edges and cover. 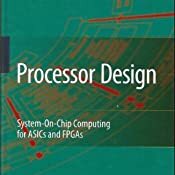 During the 1980s and 90s, increasing fab costs made processor design into a rarefied art, practiced largely in labs at a few companies whose names you already know. Since the late 1990s, reconfigurable logic has democratized processor design again. More people are creating or customizing processors to meet unique needs. 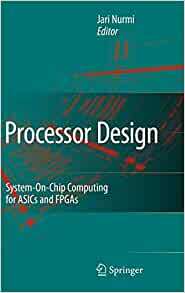 This book addresses many of the issues that the processor designer must address. Logic design is the least of those issues, and is not addressed in this compilation. Instead, this addresses higher-level concerns. Chapters 3 and 11 deal offer hard-won experience in the common problems that processor designers create for themselves; the latter deals specifically with the quirks of FPGA logic as it constrains what the processor designer should do. Another chapter presents the ever-present and ever-problematic clock distribution problems; yet another presents the basics of clock-free design. Several chapters examine VLIW, DSP, TTA, and customizable or configurable cores of many kinds. Moving up in conceptual level, other chapters address what needs to be customized, what measurements should be made to support the decision, and instrumentation needed for making those choices. Other chapters present issues about compilation, simulation, performance estimation, and testing. I can't imagine the reader who will benefit from all the information here. Compiler writers trying to deal with customized instruction sets will skip over clock distribution; embedded Java developers and ARM or MIPS designers might not get much from TTA and VLIW implementations. Every leading edge developer should be at least peripherally aware of over-all isues, though. This book supports such readers by avoiding distracting levels of detail, while presenting enough real knowledge to earn the book's price. This one's getting passed around my office. 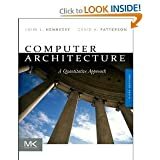 I only read a small excerpt from this book on the Xtensa processor. From what I read, this book is too out-of-date and misleading.